Jerash, located 48 kilometers north of Amman is considered one of the largest and most well-preserved sites of Roman architecture in the world outside Italy. To this day, its colonnaded streets, baths, theaters, plazas and arches remain in exceptional condition. Within the remaining city walls, archaeologists have found the ruins of settlements dating back to the Neolithic Age, indicating human occupation at this location for more than 6500 years. This is not surprising, as the area is ideally suited for human habitation. © Zohrab Jerash is fed year-round with water, while its altitude of 500 meters gives it a temperate climate and excellent visibility over they surrounding low-lying areas. The history of Jerash is a blend of the Greco-Roman world of the Mediterranean basin and the ancient traditions of the Arab Orient. Indeed, the name of the city itself reflects this interaction. The earliest Arab/Semitic inhabitants, who lived in the area during the pre-classical period of the first millenium BCE, named their village Garshu. The Romans later Hellenised the former Arabic name of Garshu into Gerasa, and the Bible refers to "the region of the Gerasenes" (Mark 5:1; Luke 8:26). At the end of the 19th century, the Arab and Circassian inhabitants of the small rural settlement transformed the Roman Gerasa into the Arabic Jerash. It was not until the days of Alexander the Great that Jerash truly began to prosper. After falling under the rule of the Seleucid King Antioch in the second century BCE, Jerash was conquered by the Roman Emperor Pompey in 63 BCE. 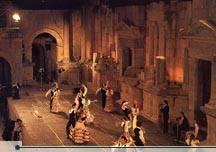 It was during the period of Roman rule that Jerash, then known as Gerasa, enjoyed its golden age. The Romans assimilated Jerash into the province of Syria, and later named it as one of the great cities of the Decapolis League. The Decapolis was a prosperous confederation of ten Roman cities formed during the first century BCE, and linked by powerful commercial, political and cultural interests. Pliny mentioned the confederation in his Natural History, listing the cities as Damascus, Philadelphia (now Amman), Gerasa (Jerash), Scythopolis (Beisan), Gadara (Umm Qais), Hippos, Dion, Pella, Canatha and Raphana. Over the next century and a half, trade flourished with the Nabateans and Jerash prospered. The city also benefited from the rich surrounding farmlands and from iron ore mining in the Ajloun area. This period saw the implementation of a typically Roman city plan featuring a colonnaded main street intersected by two side streets. In 106 CE, the Emperor Trajan annexed the wealthy Nabatean kingdom and formed the province of Arabia. The Romans secured lines of communication and trade with the Via Nova Triana (Trajan New Road), which was built between 112-114 CE and stretched all the way from Syria to Aqaba. With even greater trading riches pouring in, Jerash enjoyed another burst of construction activity. Granite was brought from as far away as Aswan (Egypt), and old temples were razed and rebuilt according to the latest architectural fashion. The city received yet another boost in stature with the visit of Emperor Hadrian in 129 CE. To honor its guest, the citizens raised a monumental Triumphal Arch at the southern end of the city. 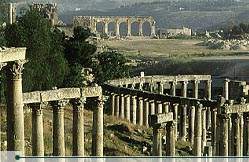 Jerashs prosperity reached a peak in the beginning of the third century, when the rank of Roman Colony was bestowed upon it. During this "golden age," Jerash may have had a population of 20,000 people. The ancient city preserved today was the administrative, civic, commercial and cultural center of this community, while the bulk of the citys citizens lived on the east side of Wadi Jerash. As the third century progressed, shipping began to supplant overland caravans as the main route for commerce. Jerash thus fell into decline as its previously lucrative trade routes became less traveled and less valuable. This trend was speeded by frequent uprisings against the Romanssuch as the destruction of Palmyra in 273 CEthat made the overland routes more dangerous. In the year 330 CE, Emperor Constantine converted to Christianity and proclaimed it the state religion of the empires eastern, or Byzantine, half. By the middle of the fifth century, Christianity had become the major religion of the region and numerous churches were constructed in Jerash. In fact, most of these were built of stones taken from pagan temples. No more churches were built after the year 611 CE. Jerash was hit further by the Persian invasion of 614 CE, which also sacked Damascus and Jerusalem, and by the Muslim conquest of 636 CE. The city was rocked again in the year 747 CE by a series of earthquakes, and its population shrunk to about 4000. Although the site was occupied in the early Islamic period until around 800 CE, Jerash was nothing more than a small rural village. 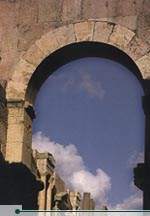 The Crusaders described Jerash as uninhabited, and it remained abandoned until its rediscovery in 1806, when Ulrich Jasper Seetzen, a German traveler, came across and recognized a small part of the ruins. The ancient city was buried in sand, which accounts for its remarkable preservation. 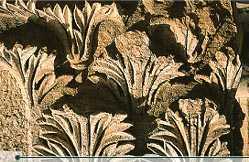 It has been gradually revealed through a series of excavations which commenced in 1925, and continue to this day. Tickets to the ruins are available at the Jerash Visitors Center at the South Gate. There, you can also find free maps of Jerash as well as souvenir shops selling guidebooks and trinkets. The ruins are open from around 07:00 until dark. From July through October, sound and light shows take place from 20:30-22:30. Call the Visitors Center (tel. 02-635-1014) for details. Jerash Festival. © Zohrab Visitors to Jerash in late July or early August can enjoy the Jerash Festival of Culture and Arts an exciting celebration of both Jordanian and international culture. The ancient Roman amphitheater comes to life once more as dancers, musicians, acrobats, theatrical troupes and others from all over the world come to celebrate the link between ancient and modern culture in Jordan.